It’s time for another Tuesday Cutline, a contest in which you come up with a caption to a photo. Click to enlarge. Photo by Emmanuel Dunand/AFP/Getty Images. We were going to write that this photograph sort of reminds us of Marcel Duchamp’s “Fountain,” but they really have nothing in common. So never mind. It actually just reminds us of the last time we were in Times Square and really had to go. Really bad. But there wasn’t a public restroom (Port Authority Bus Terminal doesn’t count. Never use the restroom there. Just don’t. Ever.) and we didn’t feel like buying anything in a store just to use the bathroom. 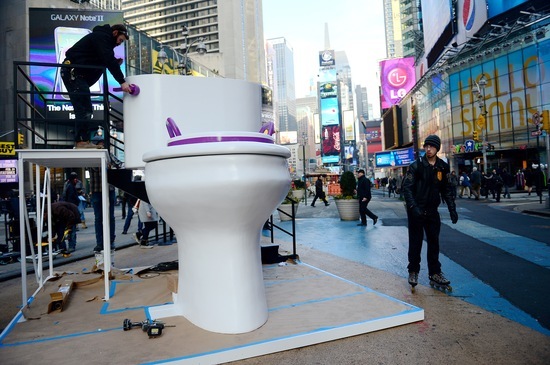 But we don’t think this giant toilet is a solution to that problem. So what is it? The author of our favorite caption to this photo will receive a NewsHour mug. We’ll announce the best caption on Art Beat the following Tuesday and send the winner an official NewsHour mug. The tiebreaker for similar or identical entries will be earliest time of submission.